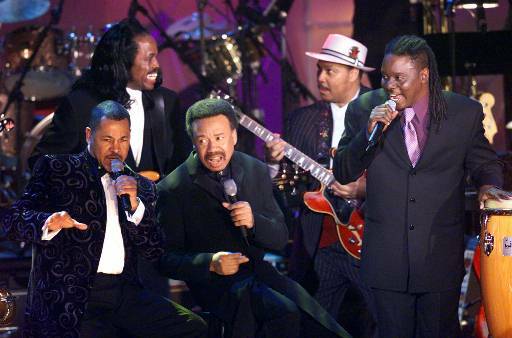 Members of Earth, Wind & Fire surround the band's leader and founder Maurice White, center. The band, which rose to prominence in the Seventies, solidified the growth of black album music as it brought together the earlier sounds of jazz, blues, R&B, pop, gospel, funk and deep soul. NEW YORK (AP) — Earth, Wind & Fire founder Maurice White, whose horn-driven band sold more than 90 million albums and made hits like "September," &apos;&apos;Shining Star" and "Boogie Wonderland," died Wednesday at his home in Los Angeles, his brother Verdine said. White, who was 74, suffered from Parkinson&apos;s Disease and had retreated from the public even as the band he founded kept performing. Earth, Wind & Fire, a nine-piece band centered featuring the two White brothers, singer Philip Bailey and the distinctive horn section, were inducted into the Rock and Roll Hall of Fame in 2000. The band&apos;s most successful period started with the 1975 album "That&apos;s The Way of The World" and continued through the rest of the decade. Other hits included "Serpentine Fire," &apos;&apos;That&apos;s the Way of the World" and a cover of the Beatles&apos; "Got to Get You Into My Life." White publicly revealed he had Parkinson&apos;s at the time of the band&apos;s Hall of Fame induction, but he had shown symptoms of the neurological disease back in the 1980s. He stopped touring with the band in 1995 because of weariness from the road combined with his health problems. White said in an interview with The Associated Press in 2000 that he wanted the band&apos;s music to inspire instead of just entertain. "That was the whole objective, to try to inspire young people to believe in themselves and to follow through on their ideas," he said. "We&apos;ve touched so many people with these songs." Bailey&apos;s bright falsetto defined many of Earth, Wind & Fire&apos;s hits. "We experienced pure magic together," Bailey said during the band&apos;s Rock and Roll Hall of Fame induction, standing next to White. The band&apos;s early sound was jazzy, but evolved into an exuberant, horn-driven mix of jazz, funk, gospel and Big Band music. Their appeal wasn&apos;t just on records but on stage, their concerts a whirl of dancing, fog machines, multi-colored lights and glittery costumes. Earth, Wind & Fire performed everywhere from the Super Bowl to the White House. Maurice White also had a substantial side career producing other artists, including Barbra Streisand and Cher. In the 1970s, he co-wrote and co-produced the Emotions&apos; No. 1 hit "Best of My Love." The band performed in the movie, "Sgt. Pepper&apos;s Lonely Hearts Club Band" and had hits with the ballad "After the Love Has Gone," &apos;&apos;All &apos;n&apos; All," &apos;&apos;Let&apos;s Groove" and "Fall in Love With Me." The band took a four-year hiatus in the 1980s and then returned, its primary success then on the road. "We live in a negative society," White told Newsweek at the height of the band&apos;s success. "Most people can&apos;t see beauty and love. I see our music as medicine."